Well here it is, Good Friday already! The kids didn't have school today, so we let them have a campout in the basement last night complete with tent, campfire snacks, sleeping bags, and a fire in the woodburning stove. They were in heaven! I'll tell you what, those kids were pooped from all our running this week...Noah slept until 8:45 and Kendall didn't get up until 9:15!!! What a treat for me, since I was (unfortunately) up at 6:45...for no reason whatsoever. On this kind of icky, rainy day, I thought I'd take a minute to purge my head of all the random thoughts that bang around in there on a daily basis. It's been a while since I've done that! 1.) I made my first ever batch of cake pops for the kids to take to school on Thursday. I'm so inspired by Bakerella, and I really want to be like her! But here's the dealio peeps...I do NOT possess the patience or the attention to detail that woman must have. I mean, her creations are bonafide works of art! Don't get me wrong, mine turned out ok, and I was happy with them...but if you have a chance, check out her blog. It is UNREAL! 2.) I've been giving some thought to trying to nudge my family into a gluten-free diet. Little by little, of course. Heck, even if we cut down just halfway, I'd be pleased with that. But we'll see. I think we do pretty much ok in most cases, and I'm always intimidated by any kind of diet that is restrictive. I think we should be able to enjoy it all...IN MODERATION. But I can also see the benefit in reducing our gluten intake. Plus, I've been a follower of Stephanie O'Dea's Crockpot 365 blog, where she makes everything (and I mean EVERYTHING) in her crockpot...and her family is gluten free. Since we've been trying quite a few of her recipes, I've realized it's not THAT hard. Maybe I'll give it a go. We'll see! 3.) Remember Fletcher and Josie, the 2 kittens we adopted back in January? Well they are growing fast and getting so much personality! They are very much a part of the family, and they eventually did take to Scout...heck, Fletcher climbs all over Scout, even going so far as to stick his head in Scout's mouth. They have decided it is their "right" to share Scout's food & water whenever they see fit, and he doesn't seem to care in the slightest. It's a good thing, as Martha would say! 4.) We just booked our airfare for our trip to the Canadian Rockies this summer. It's just a little over a month away, and we are so excited! We're headed out to Canmore, Alberta to visit our friends Sarah and Torben. I can hardly wait. The kids will have an absolute ball...we'll get to take them hiking and sightseeing...it's unbelievably beautiful there! 5.) I'm very annoyed by these gas prices. I usually try not to complain, as it doesn't do any good and just ruins your mood, but geesh! With the amount of driving I do, the amount we're spending in gas is downright ridiculous! 6.) I'm working on getting my blog up to date, I promise. I've been so busy, I haven't posted about our trip to DC, the building we're building, the progress of my garden, any of the goodies I've been making, Barry's progress with finishing the basement, the kids' tkd testings, or ANY of the fun things that have been going on around here! I'm hoping to get caught up over the next week, since things may slow down just a little. Bear with me! 7.) As much as I admit it, I think I'm going to have to give up the ghost soon and upgrade my phone before long. I LOOOOOOVE my Palm Treo. I DO!! But she's been freezing up on me quite a bit here lately and I have had her for over 3 years, which doesn't sound really long, but in terms of a cell phone, I guess she's kind of outdated. I don't care, I still love her and I'm not sure another phone will measure up. We'll see. And please don't suggest a phone that requires a data package...I don't NEED internet on my phone. I'm connected much more than I need to be already! 8.) My dog is the sweetest, most handsome doggie I know. I love him so much! But I swear, if he gets into the trash and drags it all over the house ONE MORE TIME this week, we are going to be having a "come to Jesus" meeting. 9.) I do not own an MP3 player. No, there is nothing wrong with me. I just don't see the need. I have a radio, and my kids talk nonstop. I relish quiet! 11.) Barry ROCKED my 40th birthday, just so you know...he is the best hubby! 12.) People get on my nerves from time to time. And although I try to be a positive person most of the time, I'm okay with that. I think it's normal. Just keep me in check if I start sounding like a negative, pessimistic, downer, ok? 13.) I don't want to live in a world without chocolate! My will to live would shrivel up and die. 15.) Noah and I went to Graeter's today and I actually squealed when I saw that Strawberry Chip was on the seasonal board. Girlfriend needs her ice cream fix! 17.) Tomorrow we head to the big NK for Easter bowling with the Kucks...I'm actually very excited, as the bowling alley has some really good pizza, and I haven't had pizza in a while. Let's hope this year Noah lets me win. 18.) I just finished Jeannette Walls' " Half Broke Horses" and I loved it. It's a must for anyone who loved "The Glass Castle", which is a MUST for...well, everyone! That's it for now, peeps...we've got to get to taekwondo. Enjoy the Easter weekend and make sure you eat lots of goodies! Who took up yoga to learn to be bendy. She said, "Next time I want goods made by Fendi!" Great job, Kayris!! I will contact you soon with your prize! Now don't fret, the rest of you...I hope to do another giveaway soon (as soon as I can find something cool to give away! )...this is fun! The Big 4-0...and a giveaway to celebrate!!! WOW!!! I'm officially 40 years old today!!! But alas, it is true. I have to share something with you though...I am having such a fun time with this birthday!! In fact, when Angie at Shabby Apple contacted me about hosting a giveaway, I knew right then that I wanted to do it in celebration of my 40th! What better way to celebrate than to have one of my readers win something fabulous?? So the contest starts now, peeps. The winner receives one Bali Ha'i dress from Shabby Apple...shipping included! I LOVE this dress...the color, the style, everything about it! Have you shopped Shabby Apple before? Oh my, their clothes are so trendy and cute! They have the most adorable little girls' dresses and of course, fantastic women's dresses, as well as jewelry and other accessories!! And all you have to do is write a little poem or limerick for me. See, I was just going to have everyone leave a comment and then randomly pick a number to see who wins, but my sister (yes, you can all thank her) said I had to make it more difficult than THAT to win. And so we started brainstorming and came to the conclusion that the best contest would contain laughter of some type. And would require some thinking. And creativity. Soooooo, the best poem/limerick about ME wins, I mean, it is MY birthday, after all! HAHAHA...Bring on the humor people! You know I love a good laugh! And to sweeten the deal even a little more, I'll give you an extra entry if you "like" Shabby Apple on Facebook, and also if you become a follower of my blog. If you already are, just leave a separate comment telling me so! Also, please make sure to leave your email address in your comment so I can contact you if you win! Entries will be judged by my family...Barry, Kendall and Noah...and the winner will be announced Sunday, April 10. How exciting is that? Get those creative juices flowing, peeps! I can't WAIT to see what you've got! I KNOW I said there would be a giveaway posted today...and there will!!! I just completely underestimated how busy my 40th birthday would be with phone calls, emails, and lunch plans. So bear with me while I get some things under control, and I promise I'll get the details up soon! Are you excited?!?! I am!!! I am anxious about the fact that this barn is getting close to being finished, and it doesn't look quite the way I had pictured it. The size and shape are fine, but the colors are not what I had envisioned. Unfortunately, when we had to pick all of the colors, we couldn't get all of the samples at the same time, so I was kind of flying blind. It makes me feel better, of course, that Barry agreed with all of the color choices, but still. The brown is much lighter than I wanted, and the green is much brighter. Well, what are ya gonna do? It's all custom ordered and cut, so there's no going back now. Just have to take a deep breath and deal with it. Crap. This is #1 on my anxiety radar today. Noah is starting kindergarten in the fall, and I'm trying to get my ducks in a row. Since Kendall is open-enrolled in a school district we don't live in, we have to apply for enrollment every year and wait to be accepted...which hasn't been a problem so far, because her class is on the small side. However, with Noah going into kindergarten, we don't know how big the class will be, therefore I don't know how good our chances are that he will get in. It definitely helps that Kendall is already a student because he will get priority over open-enrollment students that have no siblings attending, but it is definitely playing on my mind, as our other options are really not the way we want to go, i.e. sending him to London or paying tuition for him to go to a private school which is half an hour away. So, you see why this is #2 on the anxiety scale! I spent some time weeding out closets and dressers and I have piles of clothes everywhere, because all of my storage is FULL until the barn is finished. Clutter makes my head hurt, so it has not been the best week for Noah to be home sick...because I can't get anything accomplished! And he is on spring break next week, so looks like not a whole lot will get done then either. So this weekend is my weekend to GET IT DONE...or at least as much as I can. I went to Target today and got some rubbermaid totes and some little photo storage boxes to try to get my 'Sentimental Boxes" put together...and that's what I've been working on this afternoon. If I can find a few garage sales to participate in this spring/summer, I should be able to unload some of this stuff and make some money in the process. Wish me luck...I can't handle the clutter any more! LOL! Did you know I'm turning the big 4-0 next Thursday? No...I promise this has nothing to do with my anxiety today. I'm actually excited! I love having a reason to celebrate (and a justification to do just about anything for the next few months...lol) and the number truly does not bother me. What bothers me is that I have no plans. I know my birthday is on a Thursday (which is inconvenient), and Barry is taking me out on Saturday (he won't tell me where), but I definitely want to do something special on my actual birthday. I don't know what...just something out of the ordinary. I mean, 40 is the new 20, right???? Hello...anyone out there??? The summer to-do list is daunting. And spring is so busy, trying to get the garden in and the flowerbeds cleaned up and mulched, as well as the other various projects around here that need done. I have to tell you that as excited as I am for spring, I am tired just thinking about it! We're planning a big trip up to Canmore, Alberta this year, and I can hardly wait! We're flying into Spokane and then driving through the Canadian Rockies up to Canmore to visit our friends Sarah & Torben. We're all so excited, but Barry and I are still trying to nail down our airfare and the actual dates. Once we get that done, it's ON! I love vacations, oh how I do!! But again, the prep is so much work! Are you sick of hearing me whine and complain yet? Let's move onto happier thoughts...like our trip to D.C. last week. (Actually, that's another of the causes of my little anxious state today...I really need to upload those pics and get my blog post written!) We had fun and really saw a lot! And even better, we decided to make it our "spring break trip" every year...or at least until we feel like we've seen it all! Look for the pics soon, friends! It's amazing how things can change in just the course of a few hours, isn't it? Our little pole barn is finally going up! While I was gone, the excavator came out and leveled the pad, the stone company came and spread the gravel, the garage door guy left color samples, and our builder dropped off his bobcat and made sure everything was ready to go. YAY! I will have some storage space! But after a while, you kind of get used to not having one...and besides that, garages are expensive! Holy cow, are they ever! So you use your extra money on other projects, such as putting in wetlands, planting trees, putting in wood-burning stoves, and finishing basement ceilings. There is definitely no shortage of projects around here! Of course, not having a garage does create some issues. Like, where do you keep your big ol' lawnmower? Or your tractor? Gardening tools? Leftover paint? Leftover lumber? Your chainsaw? All of the rafts and floaties for the pond? Bikes? Anyway, our answer had always been to put it in the basement. Though now, our basement has gone through many "finishing" stages, and all of those things I listed are shoved into all of my wonderful closets and storage spaces. Oh, and in our small shed Barry built a few years ago. But we are just OUT OF ROOM. So Barry proposed building our pole barn this year. Nothing huge...just big enough to store the tractor, lawnmower, lumber, paint, tools, etc. At first, I had a bit of a tantrum and yelled, "That's NO FAIR! I want my garage!!!" as I laid down on the floor, kicked my feet, and held my breath until I turned blue. But I did consider it. If I thought it would have made a difference, I may have tried it. But the reality is that a pole barn is a lot cheaper than our garage would have been, and we don't want to take on any debt. So it's back to saving for the garage...which is fine. I can't even comprehend what it would be like to have a garage anymore! But I CAN comprehend what it will be like to have the lumber, paint, tools, chainsaw, pond floaty thingies, extra doors, Christmas decorations, and gardening paraphernalia out of the basement!! Oh, the storage space I will finally have!!!!! I can hardly wait! First let me begin by saying I've been trying to get this post set up FOREVER, but Blogger was being all wonky and I couldn't get my pictures to upload. UGH! So the big trip was last weekend! Kendall was sooooooo excited to get the heck out of Dodge and see the big city. As soon as she got home from school, we loaded up our things, waited for Barry to get home, and then we headed out to pick up Mom and Aunt Jess. Kendall chatted non-stop the entire 90 minutes to my mom's house...it was too cute. Once we picked up the girls, we headed toward Ft. Wayne and then on to South Bend, where we spent the night close to the airport (and train station! ), and then we caught the 9:00 train into the city on Saturday morning. Kendall had never been on a train before, so she was totally geeked out! After the 2 hour or so ride, we found ourselves disembarking at Millenium Station, where we caught a cab to our hotel. I didn't even think about it, but when Kendall started bouncing up and down, squealing "I've never ridden in a TAXI before! ", I knew I had to get a picture of her first taxi ride. It was only 11:00 or so, and already she'd had so much excitement! My mom is The Master at booking hotels!!! Not only did she get us a great deal, but our hotel was close to everything! We were right on Ontario and St. Clair, just a block off of Michigan. Kendall was convinced it was a 5 star hotel, at least in her book! She was in awe of the fancy lighting, bold colors, and shiny floors. She kept spinning around and around in circles in the lobby, saying "Oooooo, isn't it so pretty in here? Look at that fancy restaurant! I can't believe I'm staying in a 5 star hotel!!!". I love that kid. We wasted no time getting our things up to our room and heading out to eat...we were hungry, man! Although we really wanted to try Genuardi's, which was recommended by a friend of ours, the wait was 40 minutes, and we were clearly starving to death. I'm sure everyone could see my ribs by that point...LOL! But in all seriousness, we headed down the street to a place the girl at our hotel had recommended...Geno's East. It was alright, but I thought the pizza lacked flavor, to be honest. And to be fair, we didn't have the Chicago-famous deep dish pie, but still. Pizza should ALWAYS be good. The salad was super yummy though! IT WAS CRAZY!!!!! People everywhere, girls everywhere, PINK everywhere. Dolls, dolls, and more dolls. Books about dolls, furniture for dolls, clothes for dolls, pets for dolls. A cafe, a hospital, a hair salon and SPA (don't even get me started on that one...), and a bakery. Don't get me wrong, it was totally cute, and definitely everything little girls would love, but it was just so...over the top. And, this is just my opinion of course, I thought it was ridiculously overpriced. We went out to dinner that night, and then headed back to the hotel...it was cold and we had had a long day! On Sunday morning, we headed back to AG to have brunch at the cafe. It was very cute and fancy, and they did such a nice job making Kendall feel special. Oh, and the food was good too!! That's always a plus! After brunch, we headed back to the hotel to get packed up, as our train left at 1:30. The train ride back was pretty enjoyable because Kendall and I had the foresight to spend 45 minutes standing in line at Garrett popcorn before we left. I think everyone on the train was envious of the smells coming from out seating area! Phenomenal popcorn. I cannot quit eating it STILL. Whatever possessed me to buy a jumbo sized bag?!?! The drive home from South Bend was icky, to say the least. Rain, icy rain, and snow all made an appearance. I was so glad to finally get to mom's! We slept soooooo good that night, let me tell you! So all in all, we had a fun time, and Kendall loved her first experience in the 'big city'. Although, I must add that she is definitely not a fan of all the walking! Haha!! What a fun birthday experience for her! She talked about if for DAYS. Wow, would you just look at how fast those two weeks went by? I was doing so well, posting regularly, and then BAM! MIA again. Well, what can I say? Nothing I haven't said already, that much is for sure. Kendall turned 10 on January 28th. 10!!!!! Tonight, Kendall and I are having a little girl time...I'm taking her to see Cirque du Soleil's Dralion...my favorite!! She is going to LOVE it. I can hardly wait! 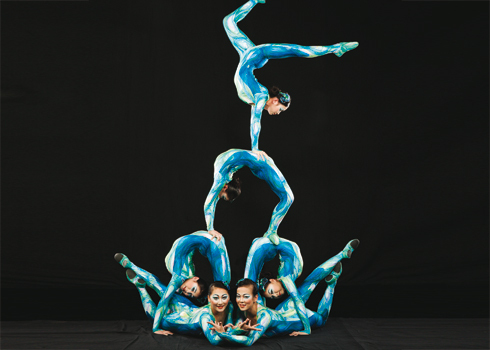 If you haven't seen a Cirque du Soleil show yet, you don't know what you're missing. It is truly the most entertaining thing I've ever seen. I didn't think we were going to get to go, as the tickets were ridiculously expensive...but then I got an email from Travelzoo saying they were running a special that cut the tickets 35-60%. I was so excited! Barry and I chatted about it, and he said, "Why don't you go and take Kendall? Noah probably won't sit that long anyway." Wasn't that nice of him? So Kendall and I are going to get all dolled up and go out for a little girls' night out. I think it's going to be so much fun! Cold, but fun. :) Have a good night, folks...and stay warm out there! First of all, I wanted to thank you all for your kind words regarding the loss of our sweet Haley. Although it was rough there for a week or so, things eventually evened out and we went along right as rain. But as any of you who have ever shared your home with a cat know, once you've been owned by a cat, the house seems empty without one. I should have known it wouldn't be long before we'd be looking for our new feline friends...and it wasn't. Kendall and Noah started begging for kittens quite a while back, and we always said no, because we were sure Haley wouldn't have taken to kindly to us introducing some rambunctious kitties to her kingdom. But now that she was gone and our house seemed so...empty...could that be the right word? I mean, seriously...there are four of us, my brother, and Scout. This house is hardly empty! But it still felt that way. There was a hole, and it couldn't be denied. Every day, Kendall would ask when we could get kittens. And every day, I would say to Barry, "You know we can't hold out much longer. We're soft. We're gonna cave sooner or later." And he would just smile and say, "Yep. It's gonna be soon." So I think it's safe to say, we were all jonesin' for some of that boundless kitten energy...something to take our minds off of Haley. So I started looking at all of the nearest cat rescues on Petfinder. 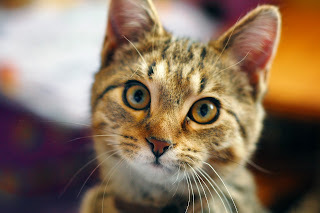 Oh my, there are so many cats out there that need a good home! It's so hard to choose, and to only take two! But we set some parameters from the get-go...we wanted a pair. In our experience, a pair always does better than one. Plus, they were going to need each other in their battle against the Dark Knight (Scout)! Lol! Also, we wanted very young kittens, so we could socialize them with Scout immediately and not have constant cat/dog issues. Other than that, we were pretty open. We found our kittens at Colony Cats Rescue here in Columbus, and they were wonderful to work with. They have a cageless adoption center, where all of the cats roam free and you can visit and play with them. This is where we met Josie. She was a single kitten, but so stinkin' cute that we could not resist her....wouldn't you agree? She fancies herself as the princess of the house, that much is clear. She sits herself on a pillow and hisses and spits at Scout every time he gets near her. She spends long amounts of time grooming her beautiful long hair and lounges around at her will. But she is cuddly and cute, and loves to play too. The house is definitely full now! And Scout just wants to love those itty bitty kitties to pieces, but he really needs to work on his approach. Charging them and giving them a tongue bath when he has them cornered is really not the way to endear himself, I'm afraid! We'll get there in time...he just needs to calm the heck down. Well, Kendall is home today with a fever of 102, and it's been a long night and day to tell you the truth. I think I'm going to go join Josie for a nap...I'm sleepy. "The new phone book's here! The new phone book's here!" Ok, so maybe it's not as exciting as the phone book, but guess what? The new seed catalogs are here!! 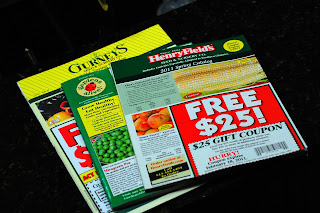 Time to start planning my garden...oh, the possibilities! In addition to the favorites we normally plant...peas, cukes, spaghetti squash, green beans, tomatoes, onions, zucchini, carrots, buttercrunch lettuce, ruby chard, cabbage, eggplant, peppers, cilantro, basil, watermelon, and strawberries. Once we get my garden planted, I hope to have time to get my new gardening shed set up and organized. Since Barry is building a new pole barn here in a month or so, I am inheriting our shed as my new gardening shed. Barry will put a few windows in it and some shelves, as well as a worktable. How very exciting for me! I can hardly wait! "Cheers to a new year and another chance for us to get it right. " The start of a new year holds so many possibilities...and to that end, I try not to make resolutions in the first few weeks of the year. See, I need those first couple of weeks to get recuperated from the holiday chaos, get some things in order around the house, and make a plan. Who has time to think of all that during the holidays? NOT ME. So now that my house is back in order (mostly), and I do feel like I'm pretty well rested (because I didn't leave the house for a week and ruled the roost wearing super-soft black yoga pants and a fleece pullover every day), it was time this weekend to get some things in order and make a plan. Yesterday, I cleaned out my fridge and washed it all out. Holy crackamoly, I cannot express to you how badly THAT needed done! Then I got a little crazy and took every. single. thing. out of my pantry and washed down all the walls and shelves and cleaned and organized it as well! It's truly amazing how much more 'on top of things' that can make you feel! After those little tasks were done, I was ready to move on to the next step...the meal plan. I typically plan out a week's worth of meals at a time. I have found that in the chaos that can ensue around here at any given moment, the written out menu on the fridge helps keep me focused and less stressed about keeping us eating healthy and balanced meals. See, if you have the menu planned out, you know exactly what you need from the store...I make the meal plan first, then go to the grocery for the week. Stick to the meal plan and you will be surprised how little 'impulse buying' you will do...because you only buy what you need! Of course, you will also be buying things that aren't on your meal plan, such as lunch box staples, if you pack for your kiddos. But overall, it helps keep the impulse buys down...and keeps you from buying pre-packaged and processed foods, which we could all use less of! Another great thing about the meal plan is the fact that you never have to worry about not having your meat thawed. I look at my menu for the week and pull all of the meat out 1-2 days ahead of time and put it in the fridge to thaw. That way when I'm ready to start dinner for that evening, I open up the fridge and there it is, ready to go. Seems pretty simple, doesn't it? Well, I can't tell you how many times I've forgotten to set something out because I had no meal plan and no idea what I was going to make for dinner...I'd get home at 3:30-4:00 and guess what? It would end up being pizza night because there was NO WAY I was pulling together something that fast. This takes all the thinking out of dinnertime and keeps you from eating PB&J and cereal for dinner three nights a week. Friday: Kendall's birthday...probably eating out! Saturday: Kendall's birthday party...I'll be cooking for a crowd, and haven't decided what yet! Now, I know it can look daunting. I get it. But let me tell you that it really isn't! Because you KNOW what's coming up and you have taken the hardest part of it - the thinking about it - out of the equation. I don't plan for lunches, because I almost always have leftovers, and I always leave 1-2 days to eat leftovers for dinner, as they can stack up pretty quick. Plus, my hubby packs his lunch most days, and let me just tell you that he really appreciates having a good meal to take to work, especially in the winter. Sandwiches get old quick! My Beef 'n Noodles recipe makes a ton, so I will take half of that and freeze it for another day. That, peeps, is what we call a BONUS MEAL! Love to find those hiding out in the freezer when you're looking for something quick and easy! One other thing to keep in mind is that if you end up not being home that night for dinner, or you want something else, or heck, you just don't feel like cooking and you want pizza... it's NO BIG DEAL. Just bump that meal back to later in the week or even to the next week. Your meal plan can be totally flexible, because you've planned for it and you have all the ingredients in the house. Go ahead and push it off to another night. The key to sticking with any new routine is to not be so rigid. No one likes rigidity, so we automatically buck the system. Make your meal plan easy, don't be too hard on yourself, and HAVE FUN! This is the perfect way to work new recipes into your favorites. I really do like sitting down to do mine...I have all kinds of recipes I've torn out of magazines throughout the years, various cookbooks, emailed recipes...all waiting for me to work my way through them. You'll never try those new recipes it you don't plan for them...you'll just keep waiting for 'the perfect day'...and it will never feel like it, because you haven't thought about dinner until 2 hours before and you're scrambling to throw something together. Put it in your rotation and find some new favorites! Meal planning...give it a try! Start your year off on the right foot! As for me, a few of the meals on my 2-week plan are new for me, so I'm hoping to get back to regular posting on Party in the Pantry! I love all the hustle and bustle, the Christmas cooking and baking...heck, even the shopping! I love the lights, the sparkle, the Christmas music, even the Salvation Army bell ringers. I love the wrapping paper and bows, the people who put antlers and a big Rudolph nose on their minivans, and the candy cane Joe-Joes. I love the Elf on the Shelf, the kids Christmas specials on TV, the fun (and sometimes, the stress) of being around so much family. And let me tell you, this year was the top of the top. Everything went smoothly from Thanksgiving to New Years, there was no family drama at any of the gatherings, everyone loved their gifts, and there was plenty of downtime to enjoy each other's company for the rest of the Christmas break. Haley, our sweet cat of 17 1/2 years, had to be put to sleep two days before Christmas. We knew she had been struggling for the past 6-8 months, as she had dropped down to 5.5 lbs and had quit eating this past spring. I had taken her to the vet then, expecting the worst. But he was happy to tell me that she was actually very healthy for her age, albeit in the very beginning stages of renal failure...we just needed her to gain some weight. So we put her on a special type of food, hoping she would bulk up a bit and feel better. She did, for a while...and then we started to notice in November that she was all skin and bones again. We decided to baby her, entice her to eat, and try to make it through the holidays before making any decisions. Well, two days before Christmas, I was in the kitchen doing some baking, and I heard this thump behind me on the floor. I turned around and there was Haley, trying to stand up. She had just been sitting there a few moments before, and had just fallen over. I panicked and ran over to her, but it was obvious that she couldn't get up...so I helped her. As I watched her, I realized she was swaying from side to side and not putting any weight on her right hind leg. This was not a good sign, and I knew it deep in the pit of my stomach. She had barely eaten at all that week...and I knew all of these things together did not bode well. Barry called the vet immediately, and they scheduled for her to come in in just an hour and a half. We sat the kids down and gently brought them up to speed on the situation, explaining how Haley was definitely in pain and how she had had such a good, long life with us. They were both extremely upset, but most especially Kendall. She spent the next 60 minutes holding her sweet kitty...snuggling her, giving her treats, and telling her she loved her. And then she insisted on going to the vet with Barry. I have to be honest with you...I did NOT think that was a good idea at all, given how sensitive and dramatic and emotional Kendall is. But she insisted, and Barry sided with her, so I agreed. We packed a wicker laundry basket with a soft towel and placed Haley delicately inside...and they were off. I sat here with Noah and worried. And worried some more. Of course, as you know by now, the news was not good. She was in full renal failure, and there was little that could be done except to keep her comfortable. Barry and I had already decided that if the news was bad, we would not let her suffer, so the decision was made. Barry took Kendall for hot cocoa afterward and they had a long chat...and I must say that she was doing really well when they got home. We buried Haley out by our garden, where we are planning to plant a special tree or bush in her memory. Kendall is sure that whatever grows there will be beautiful...and I tend to agree. Well, the New Year has started and would you believe that I've actually started at least 3 posts between now and then, but haven't finished even ONE of them? Well, folks, that ends TODAY. However, I am not going to force myself to finish those posts today, because well, I just don't want to. This first week of the new year has been a long one for us, trying to get back into the swing of our very hectic schedule after a blissful 10 days of nothingness...no taekwondo, no swimming, no school, no piano, NO DRIVING ANYWHERE. Bliss, I tell you....pure and unadulterated bliss. I was more than happy to not leave the house at all and just live in my yoga pants and pajamas. And the munchkins were happy to play Wii, and Legos, and everything else they could come up with. Of course, I cooked myself into a wonderful little frenzy over the holidays to be sure. Cookies, candies, an absolutely beautiful and tasty turkey complete with a festive salad and creamy mashed potatoes on Christmas Eve, cinnamon rolls and breakfast casserole on Christmas morning, turkey & noodles with mashed potatoes on Christmas Day...and then I was done. I barely stepped foot in the kitchen the rest of the week! And though you all know how much I love to cook and just be in my kitchen in general, I enjoyed the respite. And truth be told, we just didn't have any more room in the fridge, the pantry, or our bellies. But of course, now we are trying to get back into the swing of things...back to reality! And like I said, it's been a looooong week. So this morning when Noah requested that we skip taekwondo, I graciously complied. He and Kendall got themselves up, bathed, dressed, and quickly commenced playing Lego Star Wars. Fine with me...I've had Julie & Julia sitting here for weeks, and I've been dying to watch it. So watch it I am...while I'm blogging. YAY! Later today, the kids are headed to Aunt Jessie's for a sleepover and Harry Potter movie marathon. And I...I am going to have an awesome girls night out with my BFF. I can hardly wait! Barry is out hunting, so I can do whatever I desire...within reason, LOL! Hope you all are gearing up for a fun weekend as well! Hope to see you back here real soon...I miss blogging so much! I still need to clean my bathrooms. Anytime you're having company, your bathrooms HAVE to be cleaned. I need to find some clothes, toys, and shoes for a family who lost everything to a fire this past week. These items need to be donated by tomorrow, so I've got to pull down those tubs and find some things tonight! As I said before, I need to get the mashed potatoes made and in the fridge, as well as get the turkey into the brine. Only 3 more sleeps 'til Christmas! Are YOU ready?!? !